Moulds in various materials - Deltavorm can design and produce moulds in the widest variety of materials for mogul lines. No other company offers a wider assortment of materials to choose from! 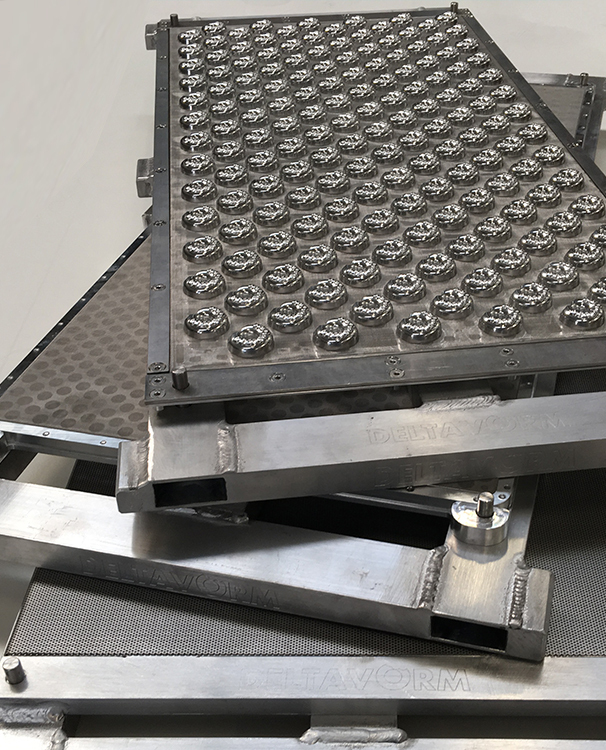 Mouldboards for mogul lines - Deltavorm can design and produce aluminum mould boards for mogul lines from any manufacturer: NID, BOSCH/Makat and W+D. We can offer a generic board for your machine that you can use for any product, or optimize it for a specific product. It’s up to you. Gluing template - Deltavorm can provide a customized gluing template. It is a sheet of silicon that you lay on the moulding board. We have cut out the shape of the moulds with a laser cutting machine. Once the template is positioned correctly on the mouldboard, the moulds will fit exactly in the template. You don’t need a specialist anymore: anyone can assemble the board quickly and accurately now! Glue for moulds - A MS Polymer Glue which can glue most of our moulds.